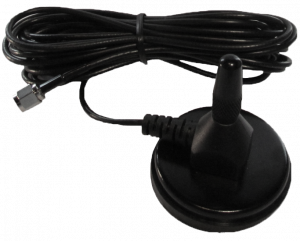 The Room Alert 32E is our flagship model, boasting the most sensor capacity in our product line. 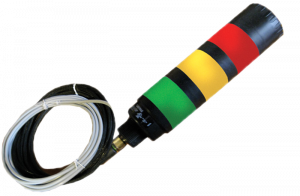 Visit the Room Alert 32E product page. 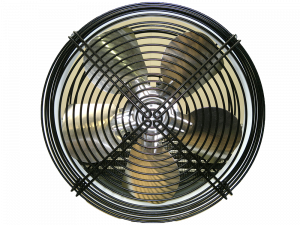 View a brief video introduction to the Room Alert 32E. Check out the Room Alert User’s Guide & Reference Manual. Click on any feature to see more information about this model. 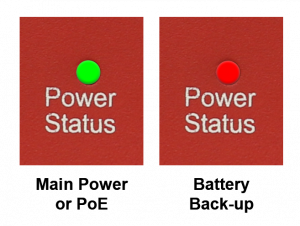 The Power Status LED indicates whether your Room Alert 32 is running on main power/PoE (solid green) or the internal battery backup (solid red). This RJ-45 port connects your Room Alert 32 to your network via an RJ-45 Ethernet cable (shown above). This port is PoE-enabled, so you may power your Room Alert 32 by connecting it to your PoE-enabled switch. This set of standard RJ-11 ports accepts up to 8 of AVTECH's digital sensors. 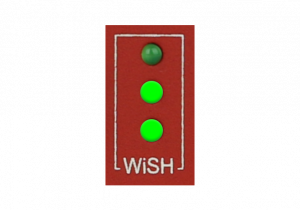 This set of ports accepts up to 2 Light Tower & Relay Adapters (LTAs), through which you can connect a Light Tower (shown above) and Relay Switch to your Room Alert 32. The Light Tower provides visual and audible alerting, while the Relay Switch can turn on and off up to 4 low-voltage electrical devices. This set of ports accepts up to 2 low-voltage electrical devices, such as a fan or an air conditioner, so that your Room Alert 32 can turn them on and off in response to alarm conditions. 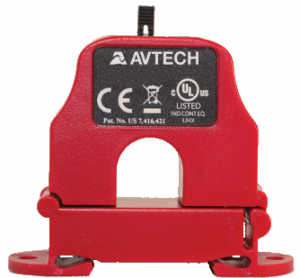 These ports accept up to 2 analog sensors, such as AVTECH's Current Loop 1 or 2 (shown above) or Extreme Temperature Sensors. 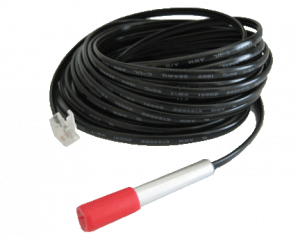 This RPSMA jack accepts the legacy model Room Alert 32W's antenna. 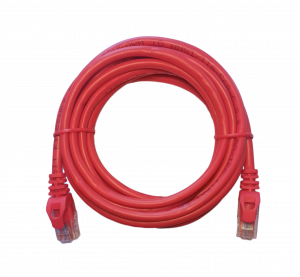 This set of ports accepts up to 8 switch sensors or dry contacts on a device such as a UPS. 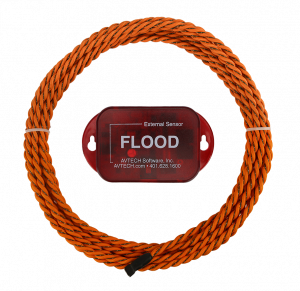 AVTECH offers switch sensors for every critical environment factor, such as power, flood (shown above), smoke, air flow and more. This button resets Room Alert to defaults. It clears out all of your custom entries, such as your password and static IP address. 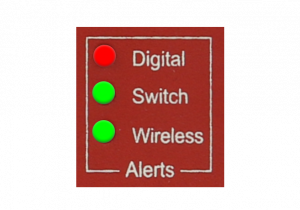 In the On position, this button engages the Room Alert 32's built-in battery backup. 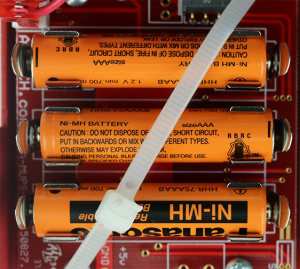 The battery backup is made up of 3 AAA Ni-MH batteries (shown above) and can power the Room Alert for up to 15 minutes if main power fails. 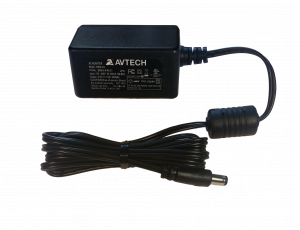 This port accepts AVTECH's 5V power adapter (shown above) to power the Room Alert 32 by main power. There are models for each and every country. 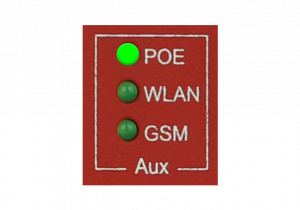 Room Alert 32 is PoE-enabled, so you may power it over PoE instead if you wish.